Sudden loss of visibility can leave even the most seasoned and experienced tactical professional vulnerable and open to attack. Prevent dangerous scenarios by keeping flashlights close and easily accessed with the M50 Nylon Duty Scorpion/Strion Flashlight Holder from DeSantis. Fabricated to fit the size and shape of the Scorpion 6P and Strion flashlights, the holder employs a vertical sleeve that firmly secures the light into place. A Velcro® cover flap provides additional retention strength as well as added protection. 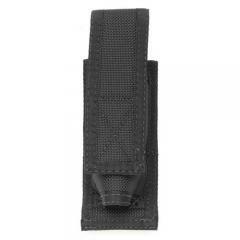 The entire holster is constructed from military-grade nylon with reinforced seams to ensure dependable service use.